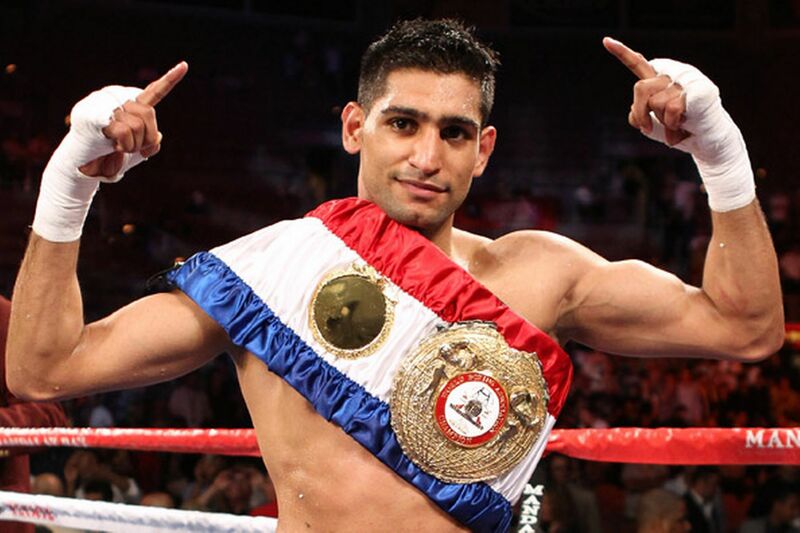 Ring News 24Boxing News Breaking Boxing NewsShould Amir Khan be banned from boxing? Staying hydrated at all times is vital to any boxer in the heat of battle. Phil Lo Greco found out last week that a good dose of H2o is not always welcome, however, after he decided to cruelly taunt opponent Amir Khan at a press conference arranged to promote their scrap. Lo Greco wasted no time in going for the jugular as the pair exchanged verbal barbs and the Canadian brought Khan’s wife and her bizarre alleged relations with Anthony Joshua, straight into the equation. Immediately Amir pounced, jumping to his feet he picked up his glass of water and threw the contents over Lo Greco. Luckily Khan did not follow through and lob the glass at his foe as well or things could really have got nasty. Promoter Eddie Hearn -no doubt secretly delighted that a “beef” element had been added to spice up the contest- dived to his feet and used his sizeable frame to separate the combatants. Any scrapping is a touch early as the bout does not take place until April 21. Khan will no doubt get a reprimand from the British Boxing Board of Control for his conduct, regardless of what Lo Greco may have said to provoke the issue. Having just signed up with Matchroom on a three-fight deal and looking to find an opening back in the UK market, Khan will be hoping that he isn’t served an untimely ban from the Board. Was Khan’s loss of control any worse than Peter McDonagh’s antics before his recent bout with Shayne Singleton? McDonagh was slapped with an eight-month ban for pushing Singleton at their weigh-in. Some felt this was excessively harsh and it will be interesting to see how Khan is judged by the same entity, in comparison. Press conference spats are not without precedence on the boxing scene and London heavyweight Dereck Chisora as been involved in a fair few over the years, including most recently when he was scheduled to appear on an Anthony Joshua undercard. Chisora, angered by opponent Dillian Whyte’s constant insults and crude threats, lifted the table and threw it across the room in Whyte’s direction. Whyte sat there nonplussed while promoter Eddie Hearn threw his hands into the air in keeping with the old boxing adage of “defend yourself at all times”. There was a serious danger of the fight being cancelled over this incident and the Board deliberated over what to do before finally deciding to take the British title off the line and fine Chisora £25,000 plus £5,000 in costs. Back when Tyson Fury was promoted in Belfast by Mick Hennessy in the early stages of his career I attended many of their press conferences and they were bizarre but entertaining affairs, without exception. Fury often took the mic and serenaded the audience with ballads and rarely did it actually threaten to spill over in to anything more unsavoury. Talking of unsavoury, prior to their 2007 super-middleweight clash, Fernando Vargas and Ricardo Mayorga got tasty at a press conference to promote the fight. Vargas had been an excellent fighter in his heyday down at light-middleweight but by this point ‘El Feroz’ was struggling to stay in shape and had eaten is way up in weight, prompting Nicaraguan motormouth Mayorga to keep calling him “fatty” repeatedly. Mayorga finally crossed the line when he mentioned Vargas’s wife and the Mexican flung himself across the room at his rival, causing a melee that took a while to calm down. When they finally traded blows in the ring, Mayorga won a majority decision and Vargas never boxed again.